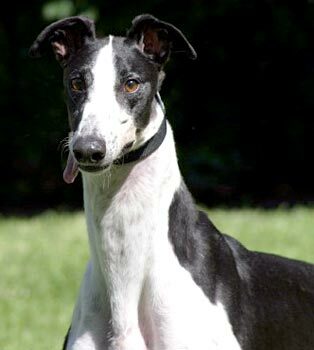 Louie, aka PTL Valley Drink, is a handsome, white and black, 2-year-old male born August 14, 2006. His sire is My Thane and his dam is Valiant Prize. 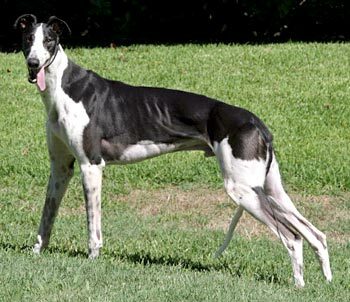 Louie, like Murphy, has no documented races to his career, as it was decided early on that he was not as competitive as others. Louie's cat test: Louie was as interested in the cats as he is with everything else. He showed no inclination to put the cat in his mouth and got a thorough sniff of one of them. When the other one hissed and darted off, he just moved on to something else. Louie is a bit of a wild child and knows no boundaries at this point. The usual cat for testing wasn't on the premises at the time, or he would've established some feline boundaries. For now, Louie passes, but supervision needs to be close. Perhaps he could be retested when he's had time to adjust to being a companion dog in his foster home. There were no small dogs there for Louis to see, so that will come at a later time. 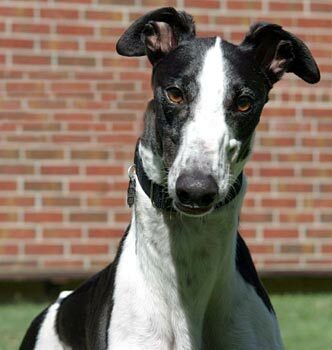 Louie is one of the most attractively marked Greyhounds around. Like most males, he’s affectionate and wants to please. But if he had a soundtrack playing behind him, his theme song would be “Wild Thing.” He is so excited to be around people he just can’t control himself. He has to greet everybody RIGHT NOW. When he was first in my home, he would come in from out of doors and jump on the sofa so he could see himself in the mirror on the wall. He’s been learning to live in a house, so with corrections he no longer does that, but he runs around the living room to make sure everything is as he left it and then runs upstairs to see if there’s anybody there. You know, there might be someone there to pet him!! If not, there’s always a toy! He’s definitely a puppy in spirit. However, he does settle down when he’s in the office with me and the girls, and will lay on a dog bed happily squeaking a toy while I check email. Louie is smart and learns what NOT to do very quickly. He just can’t seem to get the hang of the dog door; he will watch everybody come in, I will call him and call him, and yet he stands just outside the door flap. If I pick up the flap just the tiniest bit, he’ll climb through, but that translucent flap seems to tell him to stay out. Oh well, he’ll learn. The perfect home for Louie would be an active home with adults and maybe older children. He LOVES to chase a ball. 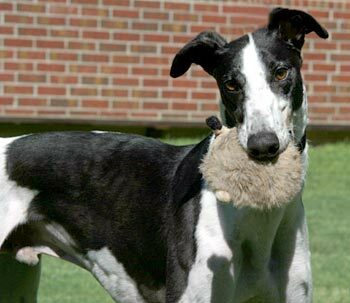 He just doesn’t know he’s supposed to bring it back – so he’d probably like to play “Greyhound in the middle.” He also likes to go for a walk, and leash training is continuing. Visit Louie and see his enthusiastic personality. I’m sure he’ll give you a kiss in exchange for lots of attention.